From the extremely popular anime Yuri!!! on Ice comes the first scaled figure of Victor Nikiforov in a suit! 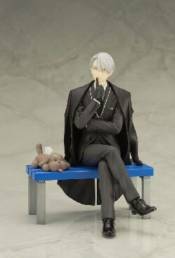 1/8 scaled pre-painted Victor sits on the bench with his charismatic smile. Both Victor and Makkachin tissue can be removed from the bench so you can display them wherever and however you like! YODA LIGHTSABER BATTLE DELUXE 16-INCH PLUSH YURI ON ICE YURI DANCING CLOTHES PLUSH 8"